January 2010 - Pebbles, Inc.
It’s my final day on the blog and I’ve had a lot of fun seeing everyone’s projects and hearing the response! So, as you’ve seen, Friday’s on the Pebbles blog is the day the design team member provides you with a tip on a technique, shows you how to do the technique, etc. Well, this part of hosting the blog had me THE MOST nervous. You see, I’m the most untechniquey person I know, and I obviously like to make up words to boot! My tip for you this week is to use up those scraps. We all saw those beautiful Pebbles products and paper lines in the CHAW pictures so now it’s time to use up the products we already have to make room! I know that’s what I’m doing and am super excited to get my hands on those new products! 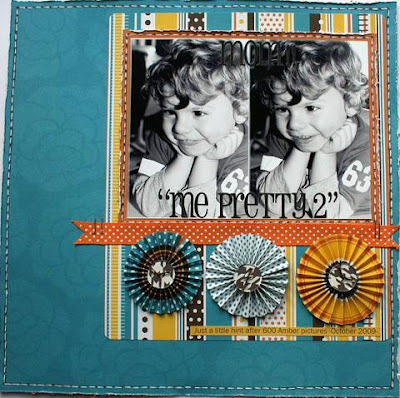 The design team did some great layouts to show how to use up those little scraps you have laying around. After I arranged the circles, I just added some extra embellishments, like Pebbles Chips, and candy dots on the flowers. Voila, scraps are used and a layout created! From these scraps she cut candles to highlight her family’s Hanukkah celebration and it turned out so, so well! Mimi used her scraps by making strips on her layout, plus outlining the cardstock to make a great frame around the entire layout! Emeline also used a circle punch for her scraps, however she used many different sizes and layered them beautifully! Love how this layout looks with all the colors! My time on the blog has been so much fun! Thank you all for taking a look at all the wonderful projects the design team created. Now bring on the new CHA products!!! Back again today with some things that inspire me every day. Thank you all for coming by on Monday to see the great projects-I know it’s an exciting week for everyone! One big inspiration for me is the Pottery Barn catalog that comes to my mailbox to taunt and tease me. If they would let me live in a Pottery Barn store I totally would. I would let my family visit me on weekends. I got a catalog just a few weeks ago that really made me want to pack my bags and move in. It was the Farmhouse Style line of products they have out now-oh be still my heart and thin wallet. I’m not a full on vintage, farmhouse, antique gal, but I do love the look and PB did not disappoint! I love how they put things together and their catalog is almost like a craft magazine with all the colors, designs, etc.-love it! 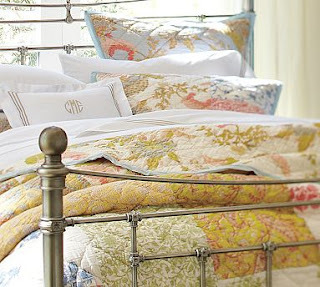 I am in love with this bedding. The colors are so calming and I’m pretty sure I’ll be making a page based on this bedding alone! 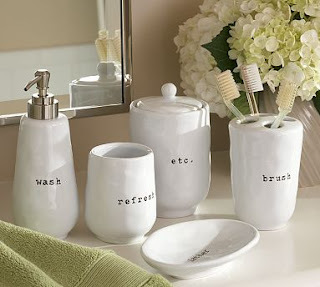 I love the simplicity and elegance of these items they have. And I’m normally drawn to simple and elegant scrapbook designs as well. I think I see a trend here! And I’m pretty sure these need to find a place in my scrap space-the possibilities are endless! Some things in my own life that always inspire me is the beach, especially in the spring and summer. We are so lucky to live 15 minutes from our Carolina beach and we go there as often as possible. So relaxing and fun for us. And the colors during the summer are amazing. These 2 show off some great beach colors and some pretty good moves too! And last, but most certainly not the least, my family is of course my #1 inspiration. They are the subjects of most of my photos, of my layouts and the reason why I am involved in this wonderful hobby! They bring color and memories to my photos and pages and also in my everyday life. They make me giggle, fret, smile and sigh all at the same time! Thank you for visiting the blog again today-hope everyone is having a great week! Come back on Friday to see how the design team used some of the scraps that are laying around their working area! Hi Everyone, Christa here hosting the blog for you this week. I must say that I’m pretty nervous since it’s my first time hosting the blog, but excited for the projects the design team created. They made it pretty easy for me this week! There is so much excitement with CHA-W this week that I’m also kind of like that kid in the back of the classroom who is waving her hand with excitement, yet everyone is looking elsewhere! I get it, I really do, since I’m anxiously awaiting all the news and photos of the show as well. So while you’re waiting, sit back, grab some coffee and take a look at what our fabulous design team whipped up for you this week! And if you’re looking for Pebbles CHA goodness, then just scroll down to the sneaks so you can take a look for yourself on what is coming your way soon from Pebbles! While we’re all waiting on the new Pebbles product to reach our doorstep, we’re going to take a look this week at how we can keep using those bits that we have left in our stash! And I know everyone is feeling the pinch of the economy and wanting to get the most bang for our buck when it comes to our supplies, or if you’re like me, the mountain of products waiting to be used up!! So this week we’re going to take a look at how we can use supplies not just for layouts and cards, but for home accents too, and on Friday we’ll look at how we can use all those scraps we have saved up to use on a layout. For this challenge I chose to make a framed accent for our home. We are constantly moving (this summer is move #7 in 12 years-yikes) so our decor has to be versatile and mobile and I thought this would be perfect to fill those spaces that I’m not quite sure where to put something! I picked up a $5 frame at Target, painted it a darker brown to highlight the project. I used entirely the Lil Miss line on this one, with some help from my Thickers for the final touch. Next Susan went above and beyond and made 2 projects for this challenge! First up is a lovely Welcome sign using the Skipping Along line. Perfect for an entryway or on a door. Her next project is a beautiful garden plaque using the So Tweet line. I am loving the watering can in the corner and think this is just adorable for any screened in porch or outdoor area-so colorful! Emeline made this adorable Memo Board. This really pops with the red Pebbles ribbons hot glued to the canvas to hold all sorts of things: cards, notes, school assignments, you name it! Akiko also made a welcome sign, but this one would look perfect sitting on an entry table displayed for all those coming to visit. She used lots of different Pebbles products on this one too: papers as a background, the ladybug sticker embellished with chipboard and a candy dot, and finally she used the chalks to get the letters the exact color she wanted. I was really hoping someone would do a frame too and Mimi did just that and I love it! She used the Lil Miss line to wrap around her frame then used some chipboard and a glittered floral sticker to finish it off. I think it highlights the photo beautifully and can compliment any room! I’m absolutely loving what Liz did with this clock! 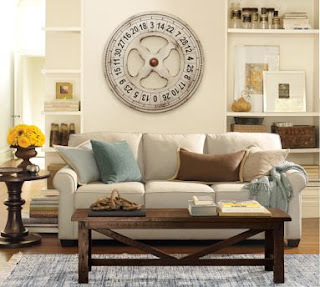 She removed the hands from an old round clock and traced paper from the So Tweet collection for the background. Then she used her Cricut to cut different heart shapes to overlap in the center. She replaced the hands, put on some accented Pebbles chips and voila: a super cute clock! Lisa made an incredible set of wall art for her daughter’s bedroom. I’m pretty sure both of my daughters would be in heaven with these pieces in their rooms! You can’t go wrong with little girls, butterflies and bright colors! These are just beautiful! Ginnifer made this super cute bow holder for a little girls’ room. We all have those hair clips and bows that are lying around and probably get lost amongst the toys! 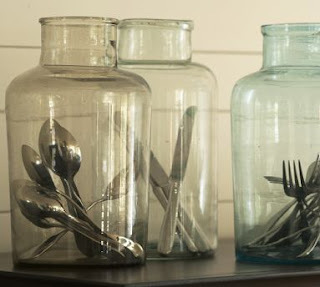 This is a great way to keep it all in one spot! Amy also made 2 projects for this challenge-wow, some go getters in this group-I love it! She made an adorable frame with a play on words with the Lil’ Miss line for a photo of her lil miss! And she made this great cover for photos for the “Nana” of the family! Grandma’s are always big fans of photo albums, especially if they’re hand made! And last, but certainly not least, is Deanna who made a colorful frame as a gift for an expecting friend. I’m sure her friend will love to display this in the baby’s room to showcase her beautiful baby! Hope you enjoyed all the projects here, and if you have any Pebbles home decor projects of your own, we would love to see those too! I’ll be back on Wednesday with some things that give me inspiration and then again on Friday with a fun and easy tutorial on using those scraps! Hi again, it’s Pam! It’s my last day hosting the blog and it has been fun! Have you seen the peeks of the beautiful new Pebbles Collections? If not click here! 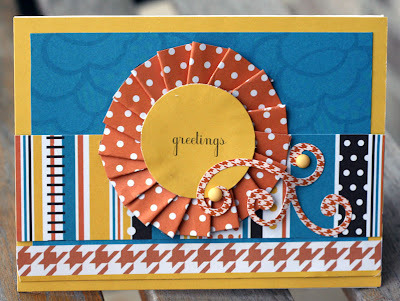 Today I am going to be showing you two ways to do paper pleating. I will provide steps to achieve both looks! This first paper pleating technique can be done quite easily, here is how to do it! 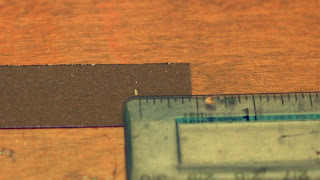 Step 1: Cut a strip of paper or cardstock, 3/4-1 inch thick and 12 inches long. With a pencil mark about every 0.5 inches on the paper. Step 2: Fold the paper back and forth like an accordion. You paper should look like the photo below. Next, attach the two ends with adhesive. 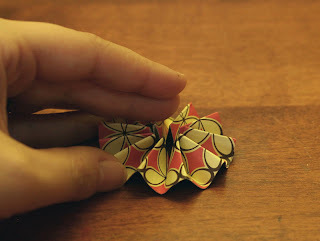 Step 3: Press down the flower to make it flat and glue it down the page and your are done! Your flower should look like this. 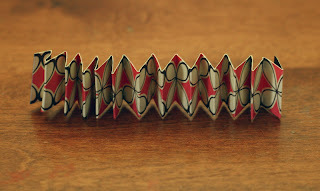 Here is another type of paper pleating and the steps to create this technique! 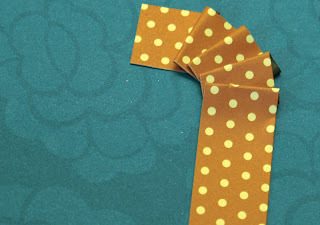 Step 1: Cut two pieces of patterned paper about 1 inch wide and 12 inches long. 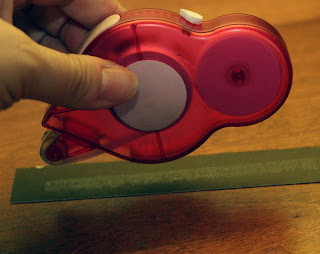 Put adhesive on the backside of the paper. 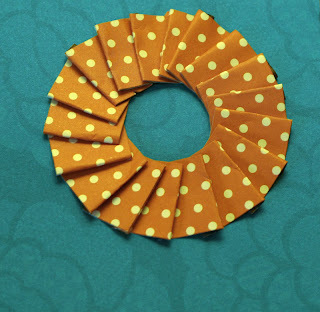 Step 2: Adhere to the background paper and begin to paper pleat but slowly angle your pleat around in circle like the photo below. Step 3: Continue to do this and use the second piece of paper if you need to until you have a complete circle like the photo below. I hope you enjoyed the week of paper pleating, what can you make with pleated paper and pleated flowers? Hi everyone! It’s Pam again and today it’s all about inspiration! There are so many things I find inspirational such as magazines, websites, ads, photos, and signs. I also find a lot of inspiration in nature. I love color, especially bright colors like aqua blues, lime greens, and vibrant oranges. 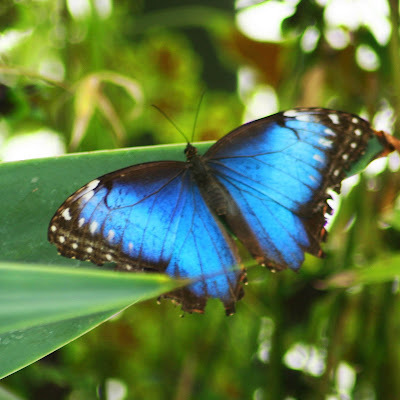 Usually I can find a whole bunch of color when we visit the butterflyhouse not far from where we live! I love how butterflies have such interesting designs and colors on their wings. So, I am going to share with you some of my favorite photos that inspire me! 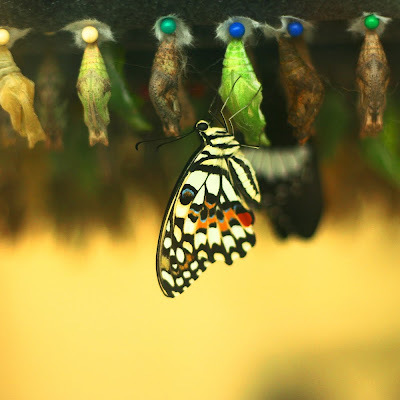 This first picture, I find inspiration in the beautiful circular design on the butterflies wings! I especially love how the design is symmetric on both sides. The colors in the next photo are beautiful! 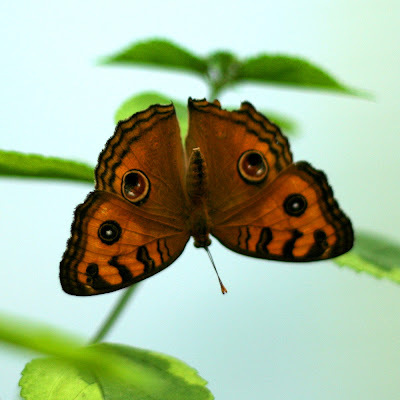 I took a photo of a newly emerged butterfly drying off it’s wings! Also, the pattern on the wings is really neat to look at. 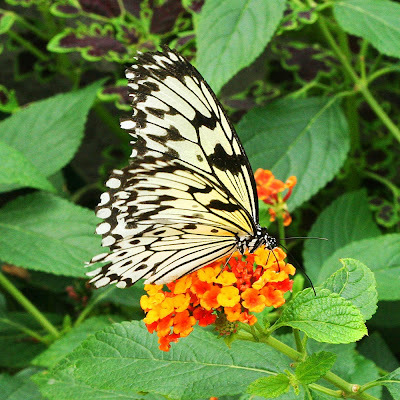 Here is a shot of a black and white butterfly sitting on a beautiful flower. I love the contrast between the black and white and the orange and green. In this photo, I love the little spots on the wings! It’s like little brads on the tips of the butterfly’s wings! In this last photo, I love the color of the wings. 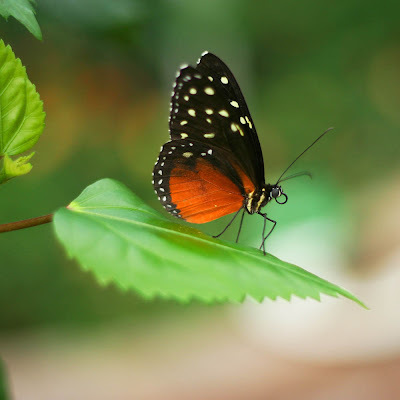 When I saw this type of butterfly for the first time I couldn’t believe how brightly colored the wings were. This is one of my favorite colors! I hope you find some inspiration from these photos! 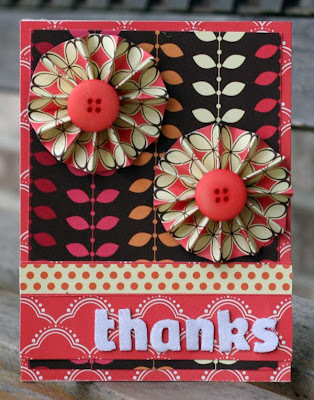 On Friday, I will be back sharing some paper pleated flowers!